The second annual mini ComicCon is back by popular demand! Everyone wants to visit the original ComiCon in San Diego, but tickets are hard to come by and it isn’t exactly the best place to bring a little one. The city of Downey has come up with a great alternative, just right to bring children of any age. Saturday, July 30th the Downey City Library held a family free event with photo opportunities, heroes, villains, thousands of new and vintage comic books, games, crafts, and local comic artists showcasing their newest editions. Everyone was encouraged to dress as their favorite comic book hero, video game character or movie mega star. But not to worry …. If children did not come in costume, they could make a superhero cape, mask, disguise or choose from one of 40 superheroes to have painted on their faces by Taylor Entertainment Company or Princess Leia. Special guests and photo opportunities were available with numerous onsite celebrities such as Storm Troopers, Ant Man. Batman and the Imperial Ruling Council, the most powerful collective body in the galaxy. Extraordinary artists were on site exhibiting their latest creations and signing limited edition comic books in Artist Alley. Chuck Patton is a DC / Marvel artist best known in comic’s circles for his work on DC Comics’ Justice League of America, when the team relocated to Detroit, Michigan, and was staffed with new, multicultural super-heroes. While working with writer Gerry Conway, Patton created Gypsy and Vibe, as well as redesigning Vixen and Steel: The Indestructible Man. Pepe Melan is the creator of ‘Tales of Blood & Fire’ and has worked as a freelance artist since 1987. He describes his style as mix of grit, surrealism, and urban art. Over the years his talent has earned him credit for the cartoon P.J. Funny Bunny and as a graphic designer for the musical artist Prince. 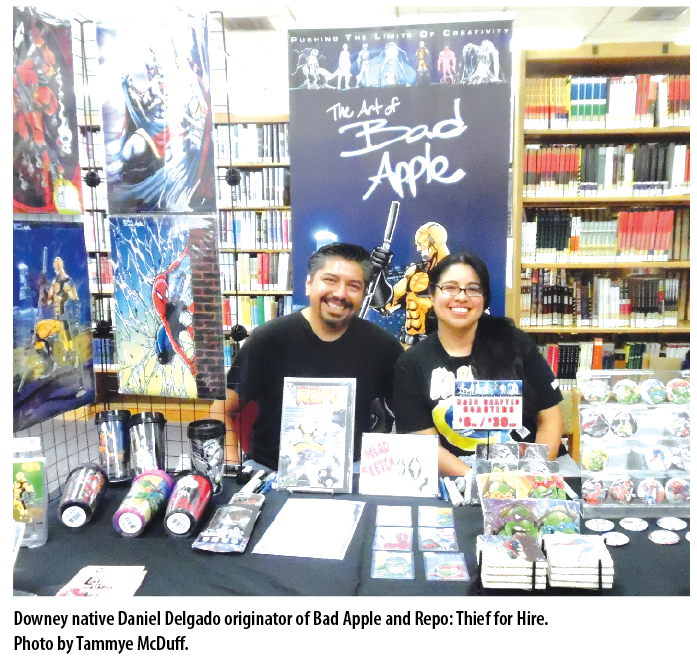 Daniel Delgado, otherwise known as ‘Bad Apple: Repo Thief for Hire’ from T.R.I.B.E. Comics is one man who in a world where criminals are looking to take control of the streets, Repo is looking to cash in on all their needs. Other artists and writer in Artist Alley included Doug Zolondek, creator of Ghost Gun; film animator Jose Guillen; Don Walker, creator and designer of Reaper Corps and Cholo Libre originator John Narcomey.